Currently 2/3 through a scratch build diorama. Because I am new to modelling it has taken a long time to get this far. I have many photographs to download, so they will be posted on a daily basis until they catch up to where I am at with the project. Last year, the Ballina Naval and Maritime Museum (NSW, Australia) acquired the original console (1964) for the nearby Wardell Lift-Span Bridge. The museum has been looking for ways to start introducing interactive displays, and the console became its first candidate. They wanted the console to operate a model bridge (which they did not have). To cut the long story short, they got me to convert the console, scratch build the Wardell Bridge, build a boat to traverse under the bridge, and set it all in a 4 x 8 foot diorama. A very interesting task you have to do......I am looking forward to see the building of your diorama. Thank you @Brian077 and @zoly99sask for your 'likes'; and @Donnie and @Uwek for your expression of interest. I hope I won't disappoint. Here are my proposed display layout plans. The display table top has to rest on a steel frame of set height. The boat has a vane which goes through the table. A pulley system, under the table, will drive the boat forward and back. The boat will be symmetrical so that it will not appear to be reversing. I spent about a month designing and drawing up the plans. Below is a montage of several drawings. Above, you can see there is a control box under the display table in line with the bridge. It is in here that I plan to install a pulley and cable system for both the bridge and the traversing boat. Below is the layout for the pulley cable systems. The counterweights are not needed for this system, so they are false (balsa). I am relying on the span weight, and gravity, to lower it back to the road. For those unfamiliar with a lift-span bridge operation. Wow....very interestinmg your description of the preparation works of this diorama. Especially I am also interested, due to the fact, that I am civil engineer (originally for bridge construction) and very interested also in old constructions like this one. For these kind of bridges you have realy solve a lot of special problems with hydraulic and lifting devices / cables etc. This is truly incredible of the amount of detail and precision that you have invested in this project. May I ask what drawing or CAD program did you use for this? Thank you Uwek for your interest, but don't get too critical with that engineering eye of yours, I am a swabbie pirate with one eye (just joking). Thanks for the very interesting video. Those tugs done a great job maneuvering the span into place. Great engineering success in building that huge bridge. You must feel proud to belong to such a prestigious company. Believe it or not, I simply used the standard Microsoft Paint program. But I used PhotoScape to convert images for the animated GIF. Wow, thanks for all your 'likes' and responses. Had a look into the console, and working out how to decipher the switch contacts in situ. It soon became obvious that the wiring harness would need to be unraveled to reroute and replace most of the wires. I decided it would be easier to start from scratch. That is, replace the harness with my own. Example of deciphering the switch contacts. Thanks @neptune John for looking in... love the Emu. The museum workshop is too small to also include this display, so I am building it at home. I have no garage. It will have to take up my lounge-dining room in the unit. 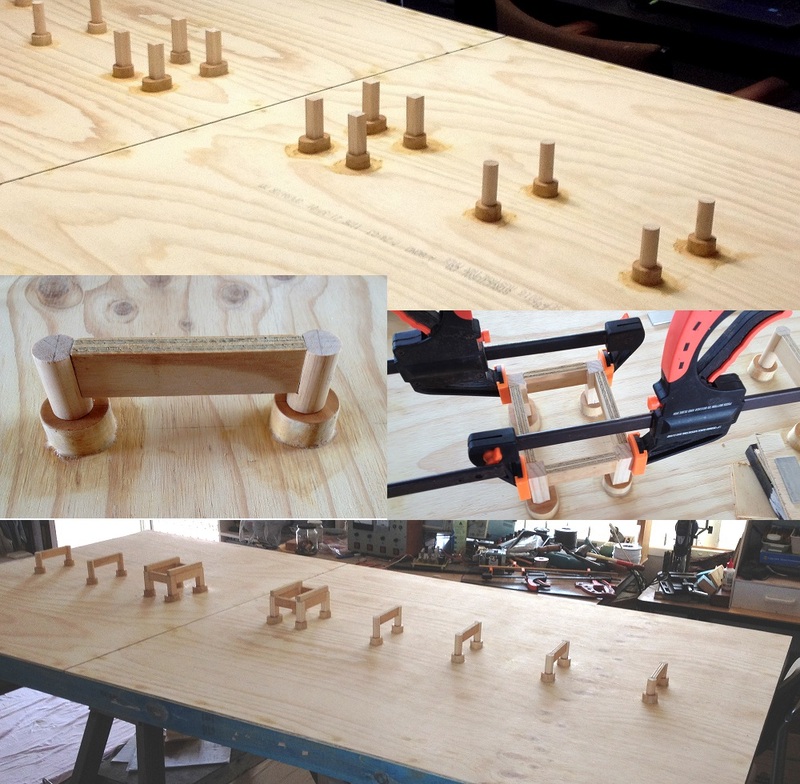 Once the timber arrived, I marked it all out, cut all the lengths and assembled the display table and its control box. The box is set aside for after the display table is sort of finished. I will then add the cable systems and electronics. Both table and box won't fit through the door. They will have to be assembled at the museum. The line across the table top is a 3 mm gap for guiding the boat under the bridge. The two doors are for accessing the control motors, cables, and various electronics. The first thing I build when doing an electronic project is the Power Supply Unit (PSU). 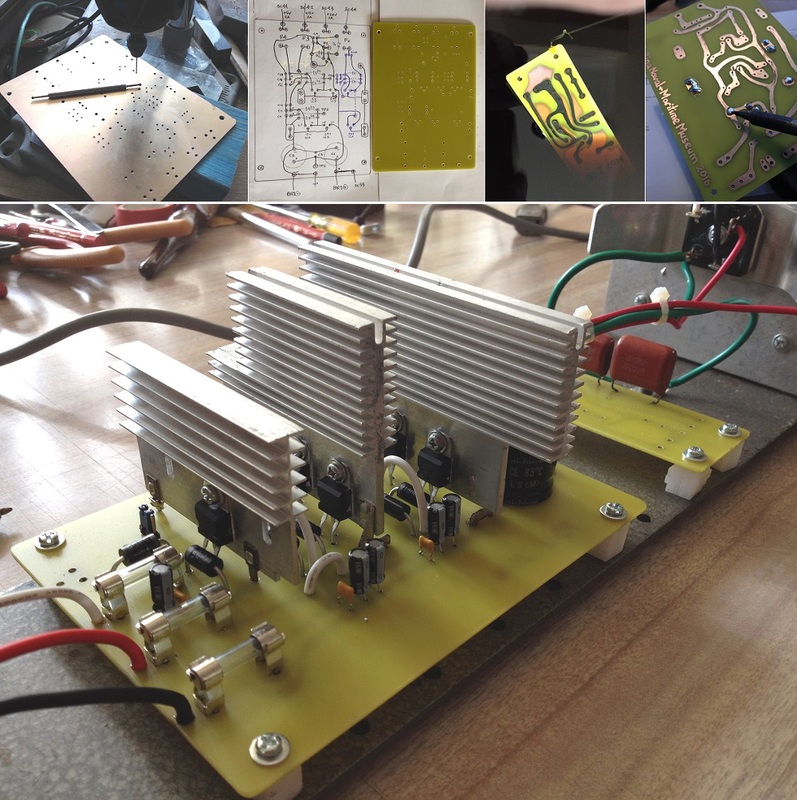 All other circuits can be designed, powered and tested from the PSU. 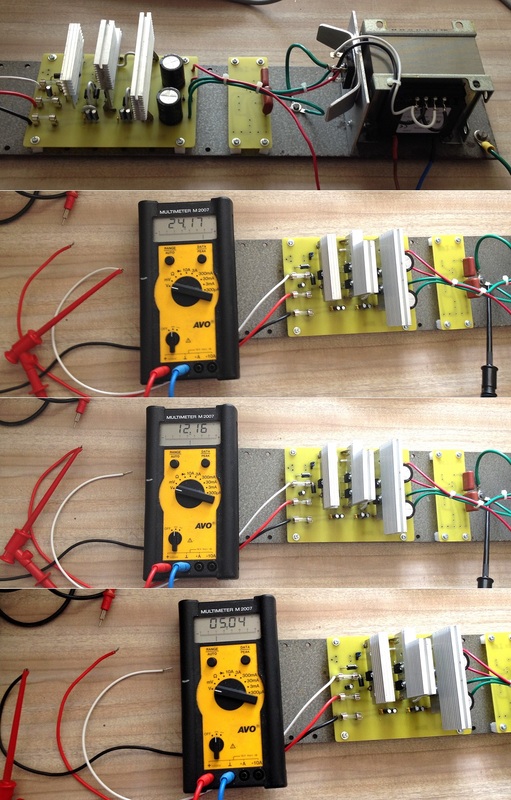 This unit will have the following voltages; 24, 12, and 5, capable of handling 2 amperes each. I have included a spare voltage circuit in case I might need it. 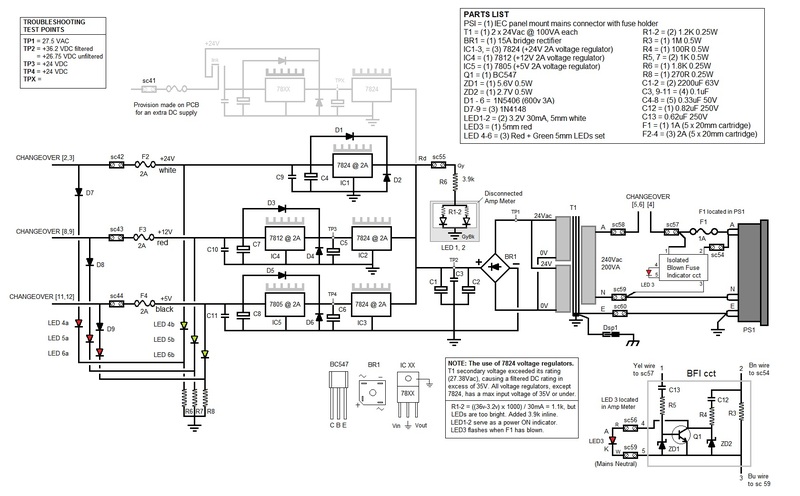 That is, if the 12 volt motors draw too much current, I'll have to add another 12 volt 2 ampere source. Used heatsinks from old computer PSUs. I am impressed with your approach. This will be beautiful project. Most interesting project. I’all be following along. Thank you Hrvoje, mrshanks, and Dave for your 'likes', and kind responses. Going back to the table, I marked out where the pier and footing centres will be. Drilled holes for installing 3 mm bamboo skewers for doweling. Cut and shaped the footings from scarp timber. 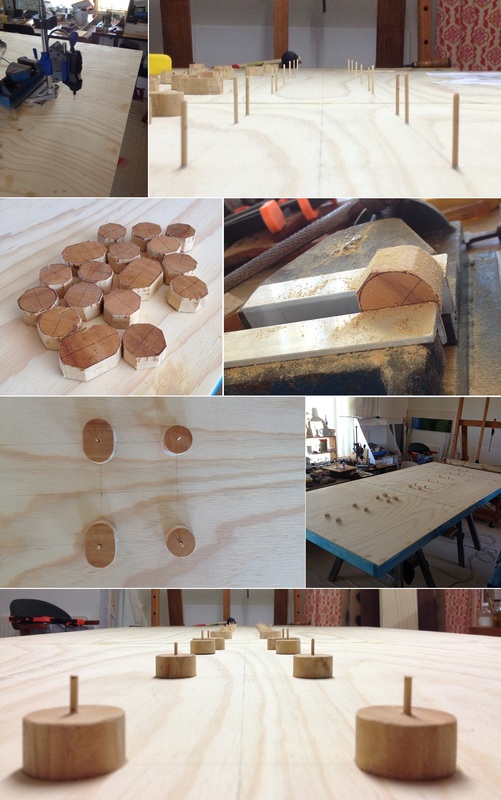 Drilled their centres and glued them over the dowels and onto the table. Used wood putty around the footings to eliminate and shadow line. Did not want the footings to appear as if floating on the water. Added piers and their crossbeams. 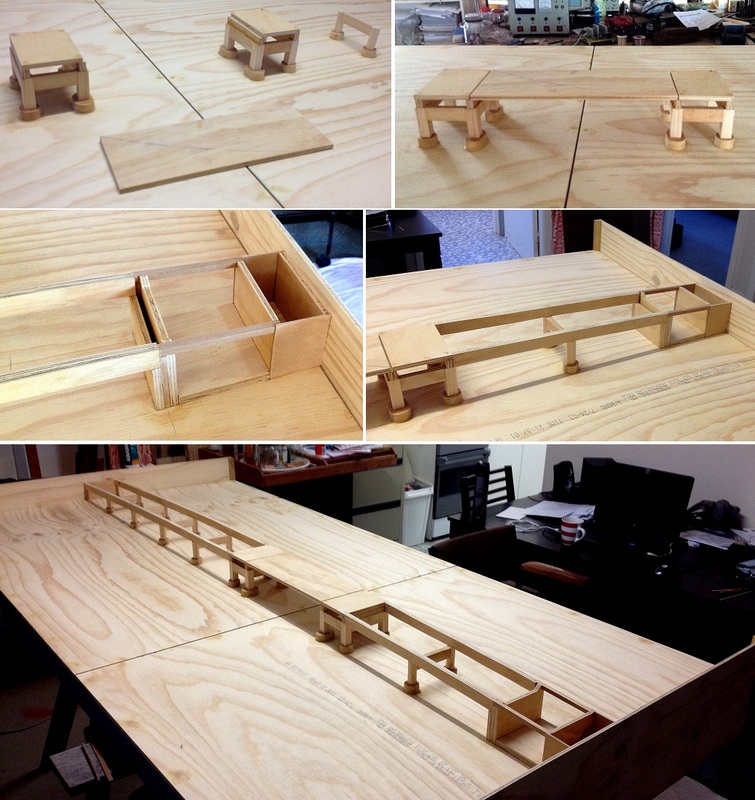 Each set has its own height so to make the bridge curve/arch over the river. Then added the girders. The centre photos show where Bridge Street will go under the bridge. 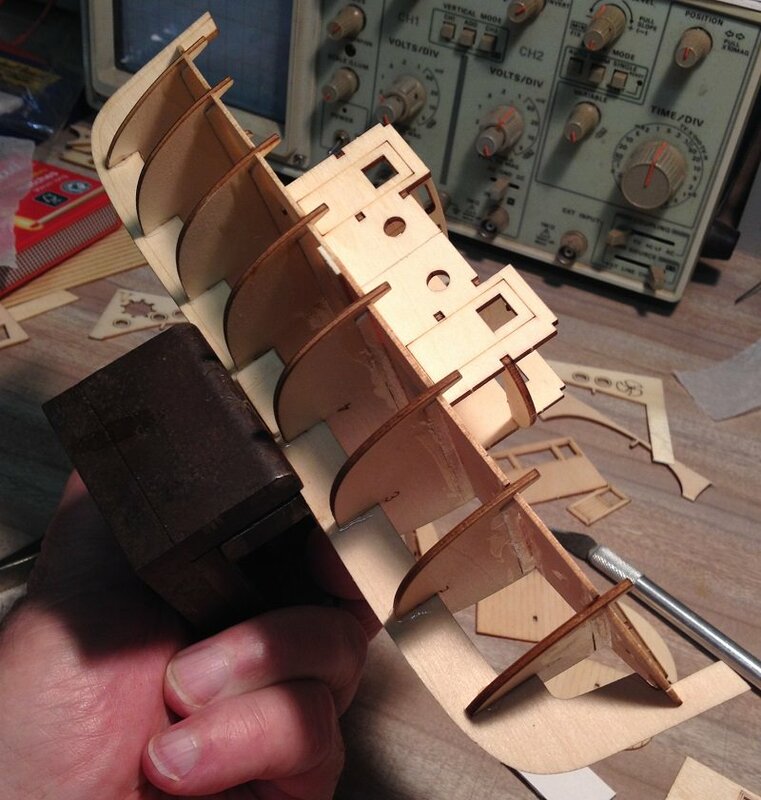 Then I added the bulkheads, checking that they are glued at 90 deg to keel. The outside cabin walls were cut and glued with supporting strips as well. 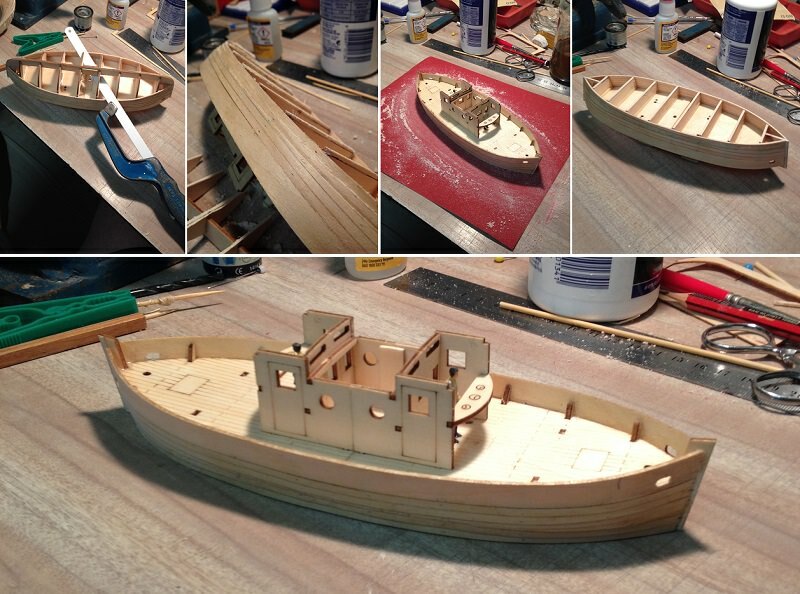 The boat will need to be cut near the waterline to make it appear as if in water for the diorama. 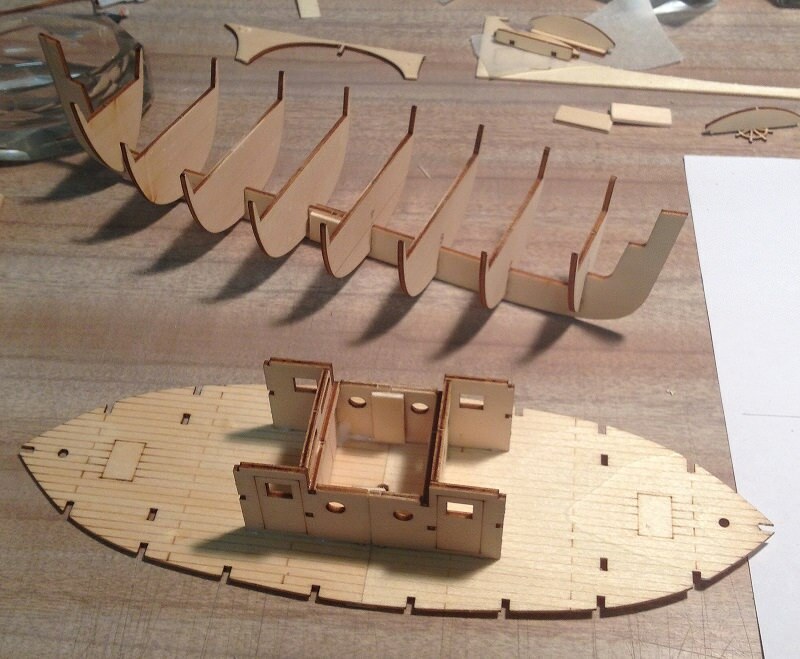 The boat will have running navigation lights and its own power supply (9V rechargeable battery). I needed room for the battery. So I added another 3 mm (using long matchsticks) to the bulkheads to raise the deck. Got the hacksaw blade out and cut off the bottom half of boat. Then laid out a sheet of sandpaper and gently sanded in circular pattern. I stopped when all edge surfaces, of last plank, got touched by the sandpaper. 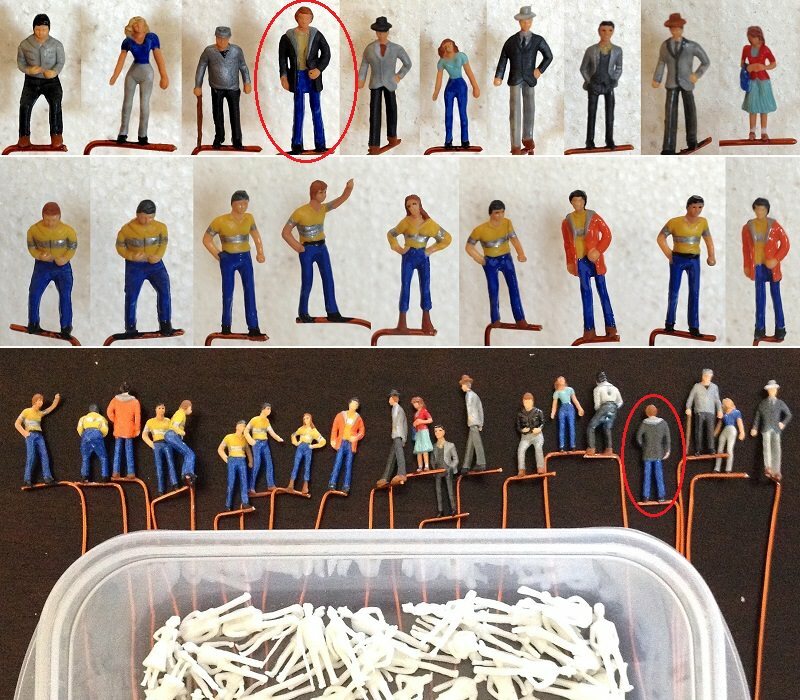 Had previously painted 1/72 scale plastic figurines for the Bridge and Boat Diorama. Painted two to look at if they belong on the boat as Captains. They are both in the two bridge sections above.